Wine or beer labels are artfully designed to draw your attention with some eye catching colors or dog profiles. But if you read beyond the pretty pictures, you may learn a little about the wine or a beer in your hand. Labels, both beer and wine, are federally required by the Tax & Trade Bureau (TTB) to have detailed information regarding the contents of the bottle, such as the name and location of the producer, sulfite info, the grape or red or white or rose, volume, where and possibly when the grapes are harvested and alcohol percentage. All this writing and what’s not there on the label tells a story about that beverage. The following may help you interpret that information. The name of the producer and where its located is required. Location tells a story, too. A winery may have many different labels but the town where the fermentation vats are remains the same. For instance, if it’s from Paterson, Washington, you can rest assured Washington’s founding winery, Chateau Ste Michelle, is involved; if it’s from Modesto,California, it’s part of the Gallo empire. You may also find a California producer using grapes from Washington or Oregon. The type or style of wine and where it’s harvested is required. In the New World, grape names, where they’re grown and possibly a vintage are on the label. In the Old World, regional names grace the label. There are a few exceptions, Alsace, Germany and Piedmont are examples of Old World wines that have grape and place names on the label. The TTB’s rules about what grape gets to be on the label are very specific. In the U.S., if at least 75% of one varietal grape is used, (85% in Oregon), then a winery can put the grape name on the label. If less than the required amount, it will probably say Red Blend or Rose or White Wine. It could read “Meritage”, which is only a blend of specific white or red grapes used in Bordeaux, France. Where a grape is grown is important information. Generally, the more specific the geography on the label the better the pedigree. For instance, on rare occasions, you may see American or a specific state on the label. California means it’s grown in California. American on the label is required when grapes come from two non-contiguous states, such as Washington and California. The more geography on a label, the better the wine. Regional, AVA and vineyard names on the label pinpoint specific and sometimes exclusive areas where superior grapes have been grown. For example, Brune et Blonde Côte-Rôtie in the Rhone, Tokolon Vineyard (first planted in 1868) in Napa or Walla Walla. The alcohol content is required. What the alcohol content will tell you if you have a sweet wine or a dry wine in your hand. That’s because during fermentation, the yeast eats up the grape sugars and belches out alcohol. The more sugars that are consumed, the more alcohol in your beverage. Dry wines range from 11.5% to about 16ish. Much depends on the grape used – some are fruiter than others. Zinfandel would be an example of a wine that could be in the 15% range and not be very dry. Sulfites are naturally occurring in all fruit wines. If a wine contains more than 10 parts per million (ppm) of sulfur dioxide, TTB requires ‘contains sulfites’ on the label. If the sulfites are lower than 10 ppm, a winery is allowed to put ‘no added sulfites’ on the label. 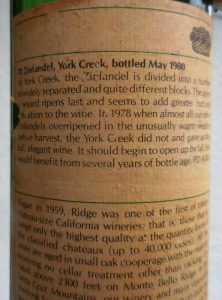 Back labels, beyond what producers think you should be smelling and tasting, could have useful information about the wine. Some information is required and some just darned interesting. The Chehalem Willamette Valley 3 Vineyard 2016 Pinot Gris tells you that the Pinot Gris is from three vineyards in the Willamette Valley. Check out the back label, you’ll learn the grapes were harvested beginning August 30th and ended September 19th. Residual Sugar (R.S.) 0.8% (dry wine), and acidity (pH) 3.21 (crisp). A bottle of Greystone 2014 California Petite Sirah caught my attention when I read Greystone and Petite Sirah. Petite Sirah could easily be my favorite grape and Christian Brothers’ Greystone Winery was the first winery I ever visited. The back label said “cellared and bottled by Greystone Cellars.” Notice they didn’t say “produced by” only bottled and cellared. My guess is the wine was fermented elsewhere and Greystone Cellars bought it, bottled and cellared it. Greystone is this massive building in Napa built by a business man to house the Christian Brothers winery and to store wines from other wineries. When it was built in 1889, it was the largest stone winery in the world. Its cavernous tunnels held 3 million gallons of aging wine. Today, the Culinary Institute of America owns the building and the name. Pretty impressive pedigree. Canned Oregon White Bubbles hails from Dayton, Oregon the heart of the Yamhill-Carlton AVA. 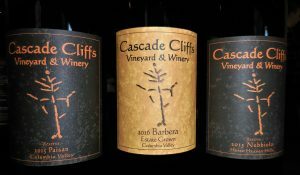 In this AVA are heavy weights as Ken Wright Cellars Lemelson Vineyards, Carlton Cellars, Soter Vineyards, Elk Cove Vineyards and Tendril Wine Cellars. The label is sparse on information but the label did say “produced and canned” which I found amusing. I was really impressed with this wine that I confess I drank from the can even though I told you to pour it in a glass. Hey, what can I say, I was on a wine adventure.